Brighton have signed Falkirk captain Steven Thomson for an undisclosed fee. The 29-year-old midfielder, who was at Crystal Palace and Peterborough before moving to Scotland, has agreed a two-and-a-half-year deal at Withdean. Thomson said: "It has taken a while to get the contract sorted but it is good to finally be here. "I know the division can be hard, and sometimes you have to go route one, but if we're going to play football here that will suit my style." Brighton assistant manager Dean White told BBC Southern Counties Radio: "He's had a successful time in the SPL. He's experienced and he's a good passer of the ball." 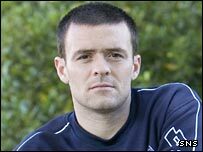 Glasgow-born Thomson joined the Bairns from Peterborough in 2005 and has made 84 appearances for the Scottish Premier League outfit. Falkirk had wanted to retain Thomson's services, but the midfielder wanted to return to England for personal reasons.